We all know that Peter Pan never wants to grow up but until now we have never known WHY he can’t grow up. 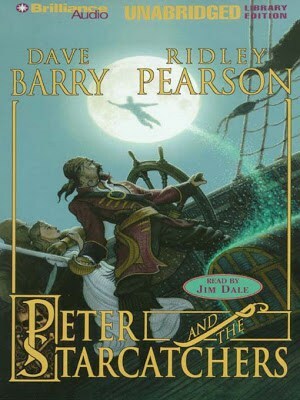 Peter and the Starcatchers is the prequel to Peter Pan. We find out how Peter comes to live in NeverNever Land. We also find out that he couldn’t always fly. It is his adventures in Peter and the Starcatchers that change him to be able to fly. He once was a completely normal boy. This book makes you love Peter Pan even more by finding out his story. This story revolves around what is called Starstuff. It is magical and falls to Earth with falling stars. There are evil people who want to use it to do bad and then there are the starcatchers who protect it from getting into the wrong hands. Peter goes on a mission to help his new friend Molly protect the Starstuff from getting into the wrong hands and destroying the world. Through his adventure the beloved story of Peter Pan begins to formulate before us. We see that before Starstuff, mermaid lagoon was just a lagoon of regular old fish. Even the smallest details are there. Even though this book was written for a younger audience, it is still around 400+ pages long. It is a quick read though and is written in a way that children will understand and adore it, but adults can love it too. Written by famed humorist Dave Barry and his co-author Ridley Pearson (author of the Disney Kingdom Keepers series), this book can be enjoyed by Peter Pan lovers and people who are being introduced to the story for the first time. It is definitely worth a read. My 13 year old son loves these books! this sounds like a neat read aloud book! I loved this book! I'm going to be reading the rest of the series, too. And Mark is working on Kingdom Keepers right now. Good books! I would love to read that. I just started reviewing books through Booksneeze. I love it. I love your blog and will be back soon. Thank you for following me through Friday Follow! I am following you back!